Details Rublev Colours Nicosia Yellow Ocher is a yellow iron oxide earth pigment from a natural mixture of minerals from deposits near Nicosia, Cyprus. Yellow ocher is not a true mineral but a mixture of similar hydrated iron oxide minerals. Nicosia Yellow Ocher is mostly made up of the mineral goethite. Known since antiquity, yellow ocher is from a natural mineral composing the pigment known as ocher (okhra in Greek). Ocher has been used as a pigment since prehistoric times and is perhaps the most widely used pigment for artists' paints. 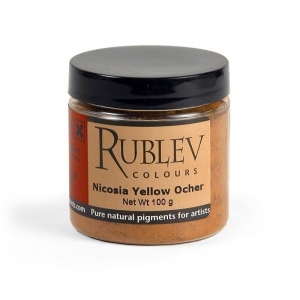 Rublev Colours Nicosia Yellow Ocher is yellow earth pigment from a natural mixture of minerals obtained from deposits in the vicinty of Nicosia, Cyprus. Nicosia Yellow Ocher is a natural earth containing clay tinted by hydrated iron oxide and traces of calcium sulfate (gypsum) or calcium carbonate (chalk). Yellow ocher is a general term used to describe all forms of hydrated iron oxide minerals (FeOOH) that occur as natural clay or earth. Yellow ocher includes the minerals goethite, akaganeite and lepidocrocite. Yellow ocher forms mostly in or near oxidized iron and other metal ore deposits, and as sedimentary beds. Depending upon the content of hydrated iron oxide, the color of yellow ocher varies from yellow to brownish-black. Yellow ocher is among the most permanent colors among the artists' palette. It is compatible with all other pigments, and can be used with good results in all mediums. Nicosia Yellow Ocher absorbs a moderate amount of oil. The oil absorption ratio is 35 parts by weight of linseed oil to 100 parts by weight of pigment. If the measurement were grams, yellow ocher would require 35 grams of linseed oil to grind 100 grams of pigment to form a stiff paste. Yellow ocher is not considered toxic, but care should be used in handling the dry powder pigment to avoid inhaling the dust.